NEWTON – The foundation for the best eight-man scoring defense in at least 15 seasons is traced through playoff losses in 2013 and 2017. The Claflin-Central Plains unit does not feature any starters more than 202 pounds, had two transfers from nearby Ellinwood, four others who were hurt most of last year and one defensive end who did not play football as a freshman. The pathways yielded another elite defensive performance in a 52-6 victory against Solomon in Saturday’s Eight-Man, Division I state championship game at Newton’s Fischer Field. The game was called with 10 minutes, 24 seconds left in the third quarter because of the 45-point mercy rule. Central Plains (13-0) captured its second state championship, first since 2014. Solomon (11-2) advanced to the title for the first occasion in school annals. The Oilers finished with nine shutouts and allowed just 34 points this fall. Previously the recent standard for eight-man scoring defense came in 2003 when Jetmore permitted 40 points. Since 2006, no eight-man squad has allowed less than 5.5 points per contest before this year. Solomon had 24 plays for minus-23 yards. The Gorillas scored their only touchdown on a kickoff return. Central Plains continually swarmed to the ball. Solomon was 1 of 6 passing for minus-3 yards. Steiner, a Claflin graduate, coached the last season at his alma mater before Claflin and Quivira Heights consolidated before 2011. In 2013, the Oilers finished 9-2 but lost to eventual runner-up Hodgeman County, 44-36, in the second round of the playoffs. That year, Central Plains permitted 24.4 points a contest. The following year, the Oilers captured the state crown, went 13-0 and improved its defense to 10.2 per game. 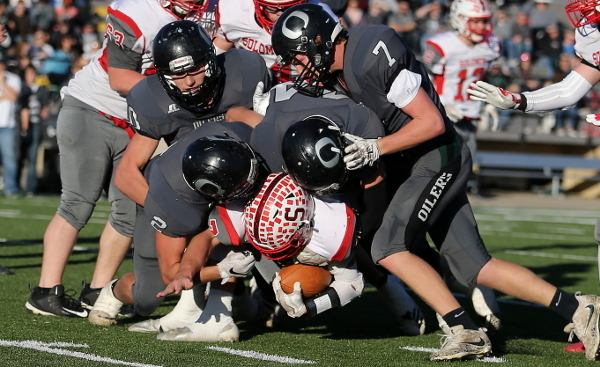 From ’14-18, Central Plains has permitted the fewest points of any eight-man program. The last three seasons, the Oilers’ 3-2 look has allowed 10, 15.1 and 11.1 points a game. Last season, Central Plains lost to Spearville, 32-28, the third straight second round loss to the Lancers. The Oilers fell on the final offensive play of the game. Multiple current starters, including Liebl, junior cornerback Lawson Oeser and senior linebacker Alex Hickel, were injured part of last season. Senior quarterback Myles Menges was able to play offense but was held out defensively most of 2017. This year, Liebl returned at defensive end, and senior nose guard Mason Doll and senior defensive end Grant Heldstab held down the other two line spots. Liebl started in the Spearville contest, and Doll played at nose guard. Heldstab wasn’t a starter in 2017 and has led the team in tackles and tackles for loss this year. Heldstab, who has 12 siblings, previously lived in nearby Holyrood and has moved to Claflin. Doll and Menges each came from Ellinwood. Steiner said this was the best defensive line he has ever coached. They helped the Oilers finish with five tackles for loss and five sacks. Central Plains opened the game with a blocked punt after Solomon netted minus-11 yards on its first drive. Menges scored from three yards out. On the conversion, Menges fumbled but the ball popped into the air, senior Devin Ryan caught it at the goal line and scored. “Probably their discipline, speed, strength,” Tiernan said of Central Plains’ best defensive qualities. “How good they were, I mean it all stuck out. But yeah, everywhere they were supposed to be, that’s where they were. Central Plains bumped the lead to 16-0 on an 11-yard run from senior Alex Hickel with 2 minutes, 17 seconds left in the first quarter. He later scored on a 52-yard run for a 24-0 advantage with 11:45 left in the first half. Hickel delivered seven rushes for a team-high 74 yards. Solomon responded with a 67-yard kickoff return touchdown from sophomore Alex Herbel. Then, Gorilla senior Jobe Fowles, who also delivered two sacks, had an interception on a great play. Solomon took over at the Oiler 24-yard line. However, Solomon had minus-6 yards on the drive. Last week, Solomon had wider offensive line splits, a change that gave Canton-Galva problems. On Saturday, Solomon sometimes had a big gap between center and guard. Still, the Oilers continued to adjust. After the game, Steiner and Tiernan met. Tiernan told Steiner he “couldn’t believe” how well Central Plains “kept adjusting” to Solomon’s offense. Menges found Heldstab for a 46-yard touchdown when he broke multiple tackles down the left sideline for his longest catch of the year. Earlier in the game, Heldstab had a 23-yard grab. Oeser delivered a three-yard scoring run to bump the lead to 40-6 with 1:55 remaining in the first half. After the break, Menges hit a wide-open Oeser on a 40-yard scoring pass on the third quarter’s first offensive play. Three snaps later, Central Plains junior linebacker Jerred Bieberle finished the season on a pick-six.